Each morning during carpool, I greet the children and watch them hurry into school with smiles on their faces and an eagerness to learn. Trinity students love school! Our students dive deeply into their learning experiences and develop a curiosity about the world that continues with them as they leave for a diverse array of high schools. I believe this love of learning is the result of a combination of our distinctive elements that make Trinity the best educational opportunity for children. Trinity’s Episcopal roots help us to deliver on our unique mission every day. The heart of an Episcopal education includes academic excellence in a place where diversity in all of its forms is celebrated. Just as Christ embraced and accepted all God’s children, we celebrate the uniqueness of every member of our community and believe a diverse environment makes all of us better citizens with an ability to learn, empathize, navigate and thrive in our diverse world. Our teachers love school too. Our talented, diverse and dedicated group of educators engage each student in ways that develop his or her creative problem solving, critical thinking and collaborative skills. Trinity teachers know each student’s strengths and challenges, and the teachers differentiate to help each child reach his or her full potential intellectually, socially, emotionally, physically and spiritually. 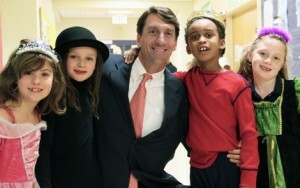 Few schools in the country do service learning as exceptionally as Trinity Episcopal School in Charlotte. 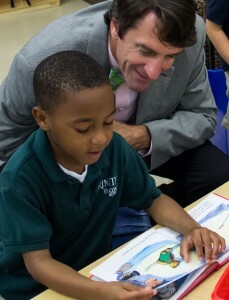 The combination of engaging children in authentic activities with a year-long partnership at each grade level and building relationships through service every other week helps students build a greater understanding in academic areas and develops a spirit of empathy and appreciation (an appreciation for human beings as creations of a loving God.). Trinity is a place of honor and integrity. Our Honor Code sets high expectations for each of us. In addition to a commitment to personal integrity, not lying, cheating or stealing, our values include individual responsibility, teamwork, respect, kindness, consideration and empathy. Our K-8 identity is a real advantage. Having worked in K-12 schools with three separate divisions for most of my career, I see first-hand the difference a K-8 school makes in creating a close community of learners. It allows us to easily build relationships across grade levels and encourages our middle school students to be role models and leaders. Not only have I noticed the profound impact a K-8 has on our school community, educational research has shown that students demonstrate fewer behavioral problems and higher academic achievement than students enrolled in middle schools. We like to say that Trinity has the longest hallways in Charlotte, as our campus community extends into the heart of Uptown Charlotte. Each day you will see our students and teachers walking to and engaging with community organizations as part of our academic program and service learning partnerships. We hope these relationships help us to be as much a part of Charlotte as Charlotte is a part of us. Thank you for taking the time to explore our website! When you are finished visiting us online, I invite you to visit our campus in Uptown Charlotte to see for yourself how much Wildcats love school and what makes their educational experience so exceptional. Society continues to push our children to grow up as quickly as possible. K-8 schools are able to teach and engage students in developmentally appropriate ways without exposure to the social pressures of high school students. K-8 schools are places where everyone knows everyone else’s name. Teachers and administrators are able to create close relationships with students. And cross-grade buddy systems – like book buddies and service learning projects – ensure that students at different grade levels know each other in very authentic ways. The result is a strong community where children have a greater sense of confidence and feel safe to take the risks that learning requires. When middle school students are the oldest in the building, they have an opportunity to serve in leadership capacities earlier. Eighth-graders often find themselves as the captains of sports teams, leading honor councils and assuming the leading roles in school productions. The K-8 model also provides students in grades 6-8 the opportunity to mentor and serve as role models for younger children. Parents often become less involved in the school community when their child attends a stand alone middle school. Because the sense of community among teachers, administrators, parents and students is so strong in the K-8 environment, parents tend to remain connected throughout the middle school years. Studies show that parent involvement is a strong correlate with a child’s success in school – and the success of a middle school program. National studies show that eighth-graders in K-8 schools attain higher academic achievement and score significantly higher than their middle school counterparts on standardized testing. In many models, middle schoolers are literally stuck in the middle. In the K-8 model, students in middle schoolers are viewed more as juniors and seniors from a leadership perspective and often they are the beneficiaries of resources that might otherwise be focused on high school students. Teachers and administrators in a K-8 community have a unique perspective on students’ growth and development. K-8 teachers watch children move from learning to tie their shoes to watching those shoes walk across the commencement stage in what often feels like a blink of the eye. But in those nine years, parents and teachers garner invaluable insight about the child’s interests, strengths and learning styles. The result – parents feel more confident about making the “right” high school decision at the end of eighth-grade rather than at the beginning of kindergarten.